I found a $100 2003 bike with no engine that had a fuel tank that fit my 2006, so the oversize tank is off and the bike feels much better even riding around the yard. I think the large fuel tank was getting in my way more than I thought it was. 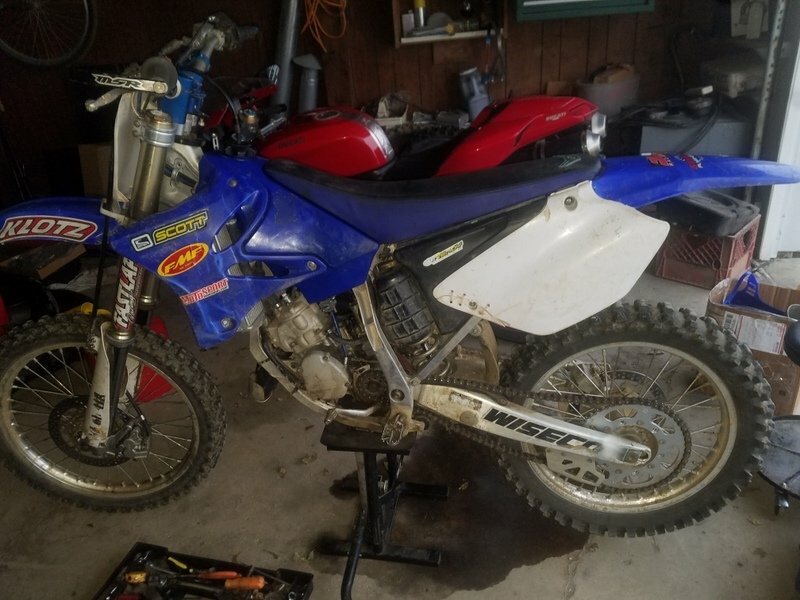 Since I've swapped several parts off the bike to make it more user friendly I thought I would try to sell some parts (big gas tank, fmf pipe and silencer and part off the 03 parts bike). My question is whether I would "grow into" liking the sst pipe and would I eventually need a big fuel tank? perhaps as a result of bad press and/or bad experiences by customers. From a few reviews I've read about the SST pipe, it requires very precise jetting and high octane gasoline to function as designed. Otherwise, the increased combustion temps created by it's 'scavenging' characteristics can lead to a damaged / burnt piston. I would honestly switch the the fatty and the silencer with it as long as it isn't damaged too much. The fatty is typically the best all around pipe in my experience and better than the SST, which I didn't like when I had one. Keep the stock tank. You will never need the oversize tank unless you plan on riding offroad for long distances. More trouble than it's worth unless you truly need it. When I bought the bike it had the large tank and fmf SST and shorty silencer and it ran fine though the power hit was really strong and really hard to control when I end up hanging on to the bars more than I should. It also has an athena 144 kit on it. I was comparing the sst and stock pipes visually and I'm surprised how similar they look. I was expecting significant length or diameter differences, but it looks like it's only a few mm. Are pipes typically that close in dimension and just slight changes to diameter, length of cone to the stinger, etc make all the difference?